After Many Successful Premium Blogger Templates, Today we are going to release our first Free WordPress Theme for our SpicyTricks blog readers. You are free to use this “Coco Mag” free Responsive Magazine WordPress theme in your blog/site. 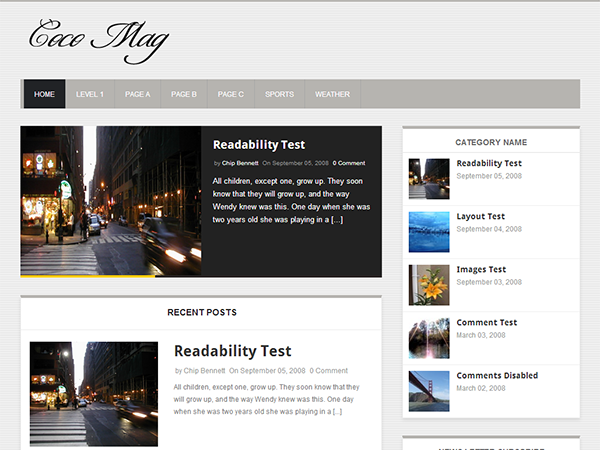 Coco Mag is a Fully Responsive theme with Magazine/blog style. It is an easy-to-customize and fully featured WordPress Theme. It has 2 columns, unlimited news sections. Theme is built on advanced solid framework which includes lots of advanced features and functions. Coco Magazine WordPress theme is not encoded/encrypted to prevent you from reading the source code. By downloading this Free WordPress Magazine theme Get the Flexible and hassle free coding to customize this theme to your desired way.